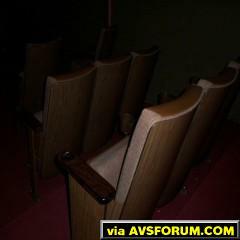 AVS Forum | Home Theater Discussions And Reviews > Home Entertainment & Theater Builder > Theater Room Items & Accessories > Anyone Using Actual Theater Seats for their HT? Anyone Using Actual Theater Seats for their HT? So my leather sectional has been gradually crapping the bed over the last number of years (many rips and tears that I've had to cover up with blankets). I'm kinda done with leather, as even though my sectional was top grain leather, I found the MLP seating area to get worn out and was the first to start tearing. 1. Anyone else rocking actual movie theater seats in their HT? Pics? What is your take on it? Would you do it again? I worry a bit that the high backed chairs may interfere with the rear surrounds getting to my ears, but perhaps once they're reclined it's not as much of an issue? 2. Where did you buy them from? Best deal? 3. I'm a happy Canuck, but not so happy when it comes to having to ship stuff from my southern neighbours (I tend to get hosed so badly that shipping is often as much or more than the item itself). So, any place in Canada that sells actual theater seats? 4. The theater seats would represent the main row that I'd be watching movies (I can fit four across). I sit at around 11 feet from a 138" scope screen which is just about right according to THX. I don't have room for a rear row, but four seats isn't enough for when I have my friends over. Any suggestions for comfortable low front seating? I don't have a 4K projector yet, but once I do the closer viewing shouldn't be an issue (although my DLP projector is VERY sharp). Gear: The Brains: Anthem MRX 720. The Brawn: Outlaw 7700. The Fun: Custom PC w/ Logitech 27 & reverse mount pedals, Nintendo Switch, Playstation PS4 Pro. The Visuals: Oppo 203, Darbee Darblet, Optoma HD3300, Panamorph UH480, DIY 138" Curved screen using Semour Centerstage XD AT material. The Audio: 7.1.4: LCR: Tannoy DC12i. Sides: Tannoy IW63DC. Rears: Tannoy DC8i. Ceilings: Tannoy CMS 603/601 DCBM. Subs: 3X Micro Marty and 1X Full Marty. 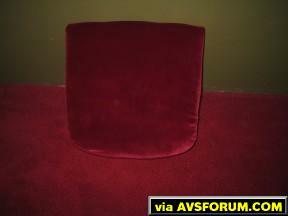 I bought Palliser theater seats a few years ago. I thought they were ok, but my wife, daughter and her friends were not fans. They like to be able to lay down, cuddle, etc. For us, a sectional is much more practical due to the above and being able to accommodate larger groups of people. We ended up selling our theater seats. I also bought my seats online without being able to sit in them. I would never do that again. I am using HT seating in my theater and was the only way to get seating for 7. I would however not do that again as they are not as comfortable as recliners and in the end the people you watch with have to ultimately be comfortable. You will lose some seating capacity but will gain comfort. Finally, having a high chair back (regardless of chair type) definitely makes a difference and would opt for low backs if I had to do it again. I'd also be a little wary of buying seats without having a chance to sit in them first. I ordered four of a well reviewed theater recliner and it was comfortable enough for watching a film but not enough for my other uses of the theater such as long gaming sessions or working on my laptop. Fortunately they'd also accidentally sent me one of their more cushy models which I found much better that purpose. I ended up replacing my two main seats with the cushy version and moving two of the original seats to a second row. Of course if you are falling asleep maybe a not-quite-so-comfy recliner is exactly what you need.